Of all the venues in the New York area, there is no place like Radio City Music Hall. Comfortable padded seats, leg room, full bar and the best sound on earth. 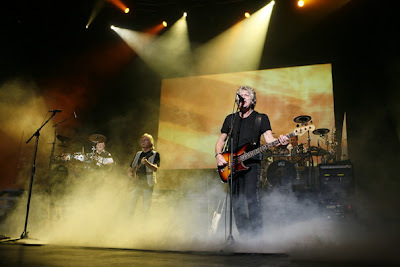 Last night inside from the summer heat of midtown was a great concert by the Moody Blues. The crowd is a mix of original fans, second & third generation fans. A pretty mellow show, some of the early classics bring the crowd to a standing ovation. The second set builds up and by Just A Singer in a Rock & Roll Band, the crowd is on their feet cheering & dancing right through the end. The sing along during Questions is definatley one of the highlights, as is Tuesday Afternoon, Just A Singer & Ride My See Saw. But Nights In White Satin is one of the best concert songs you'll ever see anyone do! It was my second Moody Blues show and again they do not disappoint. Their blend of symphonic, psychedelia, classical rock & roll is done to perfection on stage with a seven piece band. The band has sold well over 70 million albums world wide, received 14 gold & platinum discs, and remain one of the most successful touring bands in the business. You have to see them to really appreciate them, and then you realize what a great library of music they have. A staple of the classic rock radio era, when I was growing up, the Moodies songs bring me back to many different periods of life, with their music as a soundtrack to so many events. I will never forget borrowing my Uncle Mikes Days of Future Passed album, and hanging out in Ben's basement partying and drifting away into the music. Justin Hayward's voice still sounds the way he did on the albums. He sings most of the lead vocals except on songs he didn't write. He is a muti talented musician/ vocalist/ song writer. Hayward is a great guitar player carrying the Moodies through the show, mostly on his own with great rhythm & lead guitar work. He did the 1st set wearing a denim vest looking very casual with semi long blondish hair with a tint of grey to it. Hayward has aged well, and pretty much has the same face & body weight he's always had. 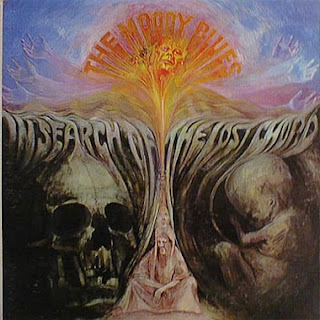 He joined the Moody Blues in 1966 after Denny Laine (of Wings) departed and changed the band into the a more commercial yet classical rock style. 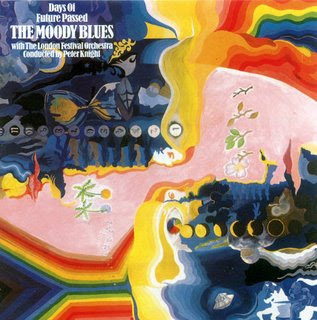 The release of Days of Future Passed in 1967 was one of the first symphonic/ rock concept albums. Certainly a masterpiece. Hayward has written many Moodies classics; Nights In White Satin, Tuesday Afternoon, Questions, The Voice, Wildest Dreams, Story In Your Eyes, & Never Comes the Day. 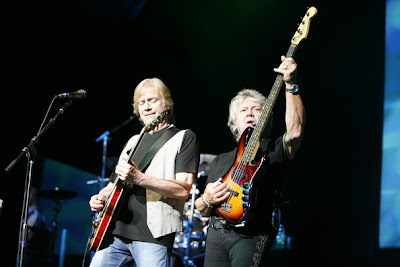 John Lodge can also still sing like he did on the albums, not only was his bass playing the backbone to the Moody Blues sound, he also played some acoustic guitar, and an amazing instrument that was a double neck bass/guitar combination. I never saw that before. Lodge is a member of the Moodies since 1966, joining just before Hayward. He has penned some of their biggest tunes; Ride My See Saw. Just A Singer in a Rock & Roll Band, Slide Zone, & Gemini Dream. He is a very Christian man and has been married to his wife since 1968, they have 2 kids. Graeme Edge is the lead drummer (of which now there are two on stage) and one of the founding members of the band. Graeme comes out from his kit and talked about the 40th anniversary of men landing on the moon & Woodstock. He then does a great percussion march across the stage during his rendition of Higher & Higher, as he recites his lyrics while the band jams behind him. He also recites his composition Late Lament which he penned off the great Days of Future Passed album. Edge has written much of the poetry found on most of the Moodies classic albums. He now resides on Florida's Gulf Coast with his girlfriend. The Moody Blues played about a 2 hour 20 minute set with an intermission in between. The original three are accompanied by a second drummer/percussionist, Gordon Marshall (since 1991) two keyboard players, responsible for the orchestration & sound effects, Paul Bliss ( since 1991) & Bernie Barlow. Then last and certainly the most important member besides the original three; Nordra Mullen, a very talented female vocalist/musician, who played the flute, acoustic guitar, tambourine & some beautiful vocals. I'm going to see The Moody Blues in Dallas in eleven days, but if I could have added a concert it would have been the one in Radio City Music Hall! Being a native New Yorker I know how fantastic a venue this is. I can't wait to see them again. I'm a long term fan (36 years now) and they only get better. BTW, Julie Ragans has been replaced this tour by Bernie Barlow, a wonderful performer in her own right! We are so happy to have Bernie back!! but you write a hell of a good review ! I have waited years for the opportunity to see the Moody Blues and finally went to the concert in Louisville on August 28. It was sold out. It was like being back in the 60's and 70's. Great music and a great performance. Thank you Moody Blues. My son & I saw them last night in Dallas with the DSO. A tremendous show, to say the least, probably as perfect as a live performance can be. Justin's voice in top form, and simply 2 hours of beautiful music. This one was over much too quickly, we could have sat and listened for hours. Nights in White Satin received a 10 minute standing ovation. I think the Moodies were touched by that. Just a wonderful concert. Can't wait for their return in the not too distant (I hope) future. The Dallas Symphony Orchrasta helped put this show on my top 3 concerts ever list. My wife and I saw them at the Fox Theatre in St. Louis last night (September 5th). We enjoyed it immensely. I was disappointed they weren't touring with an orchestra, but the songs still sounded great. 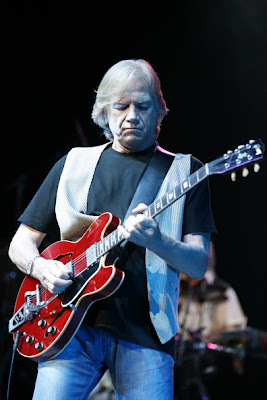 Justin Hayward provided the sole electric guitar lead and did it with skill and ease. I was amazed. I expected each of them to have a backup player. 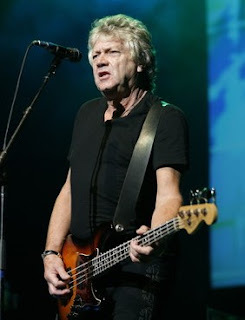 John Lodge as well did a great job with no backup support. Graeme Edge did have backup and appeared to be having difficulty with the faster drum beats. All in all, a great performance. We're running out of years to see these guys -- don't waste time!